REMOVE the outer coating from a strand of optical fibre, bend it and attach a sensor to detect the tiny amount of light that will leak out. Hacking into an optical network like this is the modern equivalent of a wire tap. But now a laboratory in Cambridge, England, has found a way to turn a hacker’s screen instantly blank if he infiltrates the network. This is because the data are being encrypted in a new and probably unbreakable way with one of the first practical devices to be developed for quantum information technology. The idea of using the more arcane aspects of quantum theory to do things that standard information technology cannot manage has been around for a while. One branch of the field is quantum computing. This, if it can be made to work routinely, promises machines that can do lots of calculations in parallel instead of one at a time, and thus solve problems existing computers cannot manage. The other branch is quantum cryptography, which promises unbreakable codes for messages. At the moment, quantum computing remains a laboratory curiosity—though a Canadian company called D-Wave has created a device known as Orion that it hopes to commercialise. Quantum cryptography, however, will soon pass into the quotidian realm if Andrew Shields and his colleagues at Toshiba’s research laboratory in Cambridge have anything to do with it. Over the past few years they have been working on the various bits and pieces needed. And, as they report in Nature Photonics, an important part of the puzzle has just fallen into place. The device in question is a photon detector. That is not very exciting by itself, but this detector counts single photons (the particles of which light is composed)—and can do so at room temperature. Most quantum systems are upset by heat. Orion, for example, operates near absolute zero, and previous attempts to build single-photon detectors have suffered similar constraints. Dr Shields’s device, however, is a simple modification of the sort of equipment that is already used to detect multiple photons, and should thus be easy to deploy. Such devices, known as avalanche photodiodes, rely on the fact that when a photon hits a semiconductor it often knocks an electron out of place, creating a positively charged “hole” in the crystal lattice in the place where the negatively charged electron used to be. If an electric charge is applied to the crystal, these holes and electrons will move in opposite directions, knocking into the lattice and creating more and more holes. The resulting cascade of electrons and holes is easy to detect, showing that light has struck. What is not easy to work out is exactly how many photons have arrived. To do that, you need to look at the signal just after it has been created, when its size bears some relation to the number of holes that started it. At that point, though, the signal is small compared with the electronic “noise” caused by the machine’s operation. 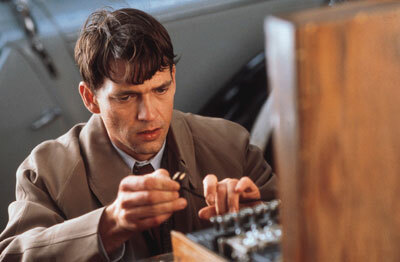 What Dr Shields did was to work out a way of subtracting the noise, and thus extracting the signal. Such a photon counter is essential if quantum cryptography is to work, because it will allow what are known as quantum repeaters to be built. In a classical telecommunications system the signal has to be boosted by a repeater every 80km or so. But a traditional repeater destroys the quantum states of the photons, such as their planes of polarisation. That does not matter for classical telecoms, but matters very much for quantum cryptography, which relies on the fact that no eavesdropper can intercept the message without changing those quantum states, and thus giving away the fact that he is on the line. Dr Shields’s photon detector, however, permits cryptographers to use a phenomenon called quantum entanglement to make a repeater that does not destroy quantum states. Entangled photons share quantum states. Such a quantum repeater uses groups of three photons for each bit of the message. One—call it A—is part of the original transmission. The other two, B and C, are created further down the line in an entangled state, and sent off in different directions. C goes to the recipient while B is fed into a device called a beam-splitter, where it meets A. The purpose of the beam-splitter is to compare the quantum states of A and B. If they are the same, the two photons will come out of the beam-splitter together. Since B and C have the same quantum states, that means C also has the same quantum state as A. If A and B are different, they will come out of the beam-splitter in one of three different places, depending on exactly which way they are different. The information from the beam-splitter is then transmitted separately to the recipient, so that he knows whether to accept C unaltered as part of the message, or apply one of three mathematical transformations to it, to arrive at the right result (this does not compromise secrecy, since any eavesdropper will not know what the transformation needs to be applied to). It is for this reason that you need a device, such as Dr Shields’s, which can detect and count individual photons as they come out of different parts of the beam-splitter. Now that there is one, the eavesdropper’s days may be numbered.